Data is from the Arbeitsgemeinschaft Online Forschung (AGOF) report titled "internet facts 2015-01." The report is based on a three-method approach, including on-site tracking and two surveys. Approximately 15,000 on-site interviews were conducted during November 2014-January 2015. 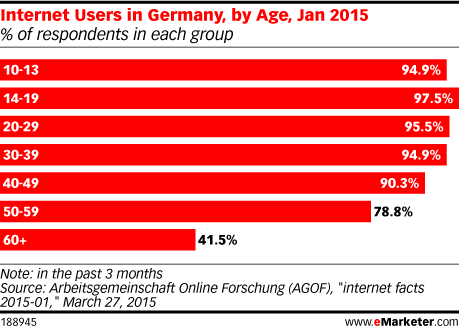 That data was merged with results from a biannual telephone survey of 42,000 German-speaking consumers ages 10+ in Germany.